We can produce a concept design for viability study, by drawing on our experience for many different types of boats. Using the latest available software and methods. Alucraft build prototypes for shipyards, that are used as a model for the construction of multiples, as well as for gathering data. We can design, build , outfit , test and deliver your vessel. Pre-cut boats are supplied with waterjet package to many yards. 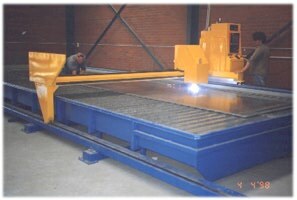 CNC plasma cutting is done on our premises, and Alucraft can also cut your existing files. Our waterbed is solely dedicated to aluminium alloys to avoid any contamination of the cut metal with steel and other metals. Cutting capacity is to 40mm and the bed can accommodate sheets 10 metres long by 2400 mm wide. Bend markings, centre lines or simply positioning of future parts on cut parts are made by use of a Numerically controlled pen marking system in preference to a scriber. Choose from existing designs, or we can design one to suit your needs. Alucraft provide the complete design and CNC plasma cut package and waterjets, to yards in Asia and the Middle East. With this package boat building yards, can gain help from the experience gained since 1989, and thus enable them to start aluminium boat production rapidly and avoid many pitfalls that come from lack of experience. To date many yards in Asia, the Middle East, and Oceania have built pre cut packages designed and pre-cut by Alucraft.